With a Walmart eGift Card, you get low prices every day on thousands of popular products in-store and online at www.walmart.com. You'll find a wide assortment of top electronics, toys, home essentials and more. 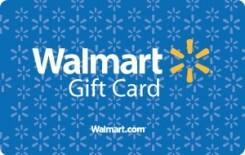 The Walmart eGift Card can be used for purchases at Walmart stores, walmart.com; also for purchases by SAM'S Club members in U.S. SAM'S Club stores and at Samsclub.com. Walmart currently has over 10,000 retail units, including Walmart stores, SAM'S Clubs, Walmart SuperStores in 27 countries. Check out the Swagstakes Portal where you can win this card or tons of other brands for a fraction of the Rewards Store prices!